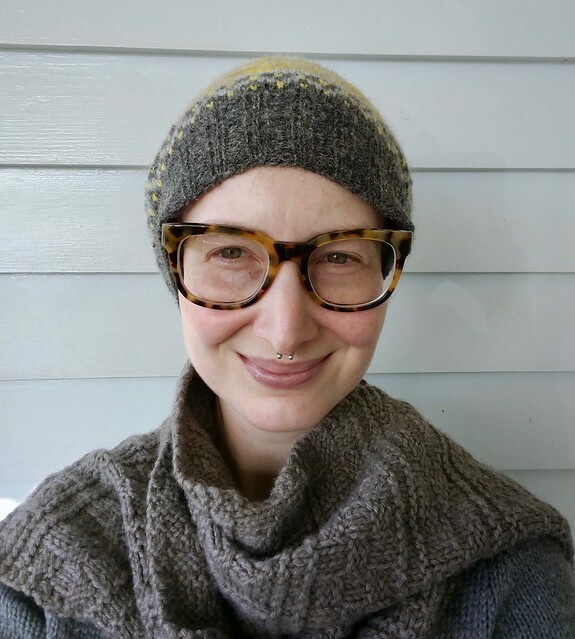 So I quickly knit up the hat – knitting goes fast when you’re loving the project! 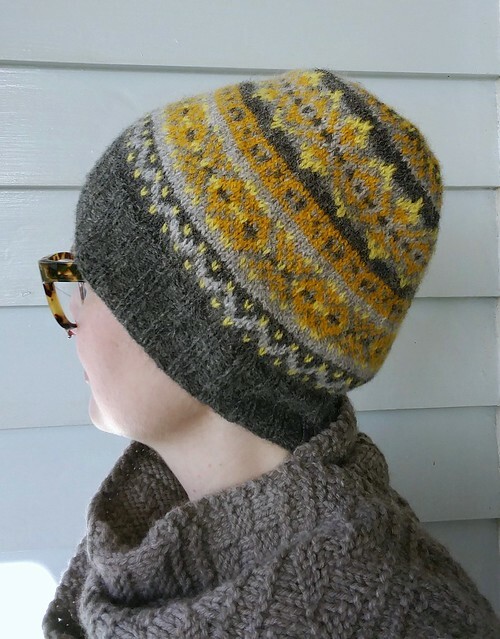 But when I proudly wore it out and about, it was so big that it fell down my head and over my eyes, in a style that would be cartoonishly hilarious if I wasn’t so devastated by my beloved colourwork project being a complete flop. It’s really, really hard to get a good photo of yourself from the side. This result was entirely down to user error on my part. 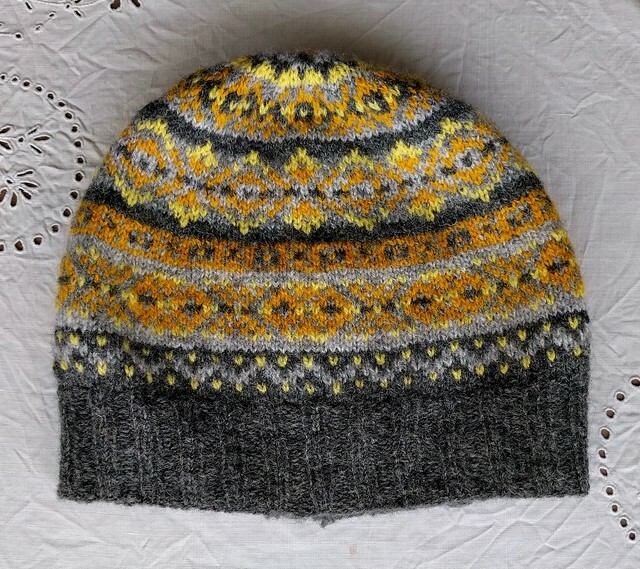 Before settling on a stranded colourwork technique which would achieve consistent tension, I had knit and ripped back a partial hat. 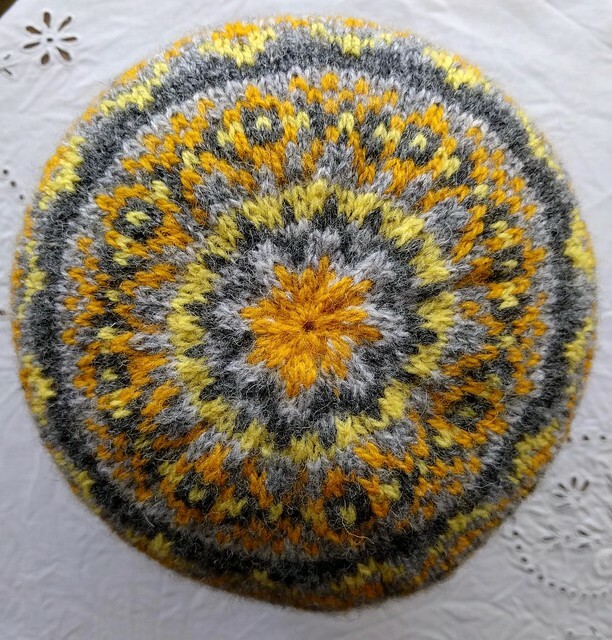 I had knit enough before ripping to determine the size chosen – M – was far too small for my head, so when I reknit for the final time, I began with a size L.
What I didn’t realise was that the too-small hat was caused by tight floats, not the size or stitch count itself. When I reknit it with sufficiently loose floats, the fabric would have relaxed enough for a size M to be a perfect fit. There were some gauge issues there too – I got the stitch gauge approximately right, but obviously there was something off with the row gauge as my hat measured several inches (!) longer than the schematic. I cut off and reknit the band a few times, trying to make it tight enough to hold the hat in place, but the whole thing was too damn big. And as Fair Isle knitting is essentially like an integrated fabric, rather than one long strand of yarn, there was no way I was ripping it back. 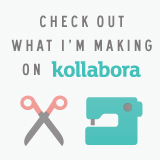 Until I realised – what do you do with a project made from fabric that is too big? 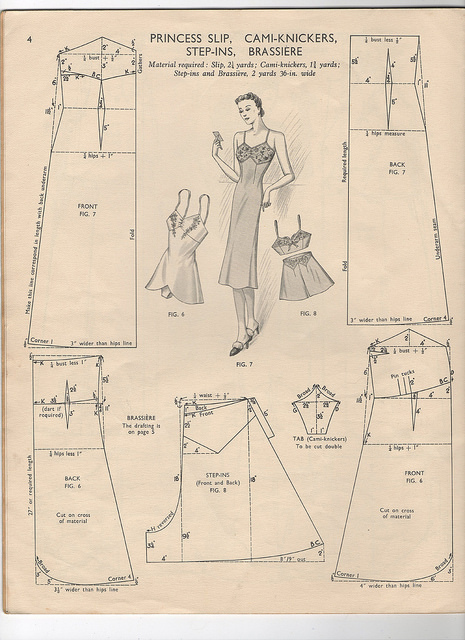 Cut and sew it, of course! I’m not a complete stranger to cutting my knitting. My first cardigan was far too small, so I cut and seamed the sides – you tend to be fearless when you learn from old knitting books that presume competence! But cutting (or steeking) colourwork is another skill entirely. I carefully mattress stitched away one whole pattern repeat, each half on either side of the jog, making the hat a size M. I catch stitched down the seam allowances to the hat, trimmed, and added a bit of hasty crochet slip stitching to the ribbing which was coming undone far too quickly for my liking. 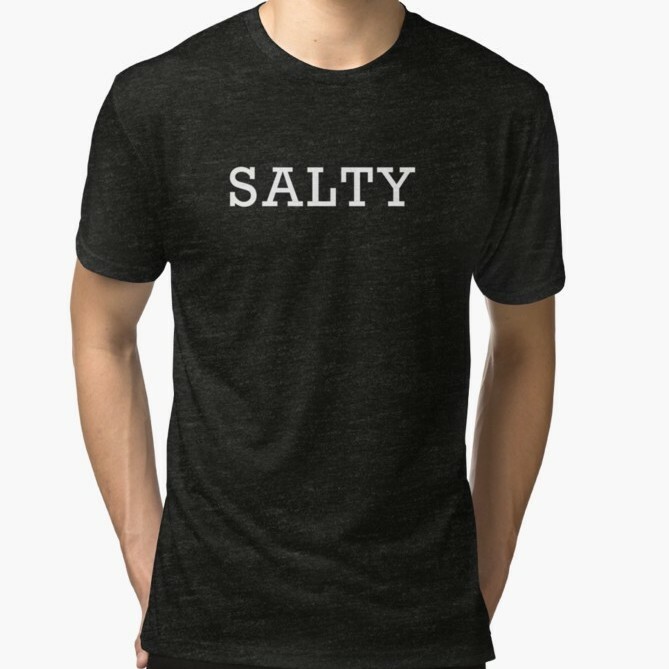 And now it is wearable! Hooray! The band is still a bit too big – even though the stitch count is fewer than the size M (due to my ripping back and reknitting), my gauge in ribbing was obviously so loose that the band is still wider than the pattern measurement. Combined with the very tall hat, it still slips down my face a little. I really should have undid the band, seamed the hat and reknit it, but now that it’s cut and seamed there’s not much I can do about it (hindsight is 20/20, eh?). 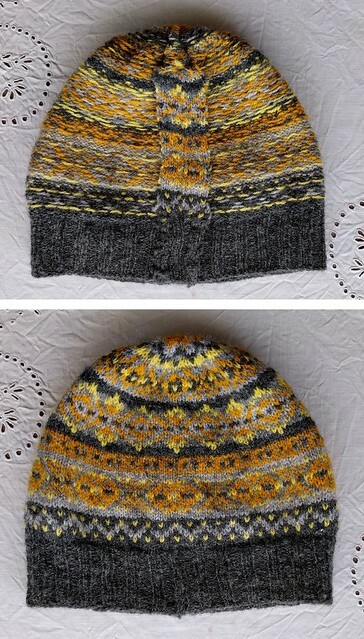 Comparison of the unblocked and blocked hat. 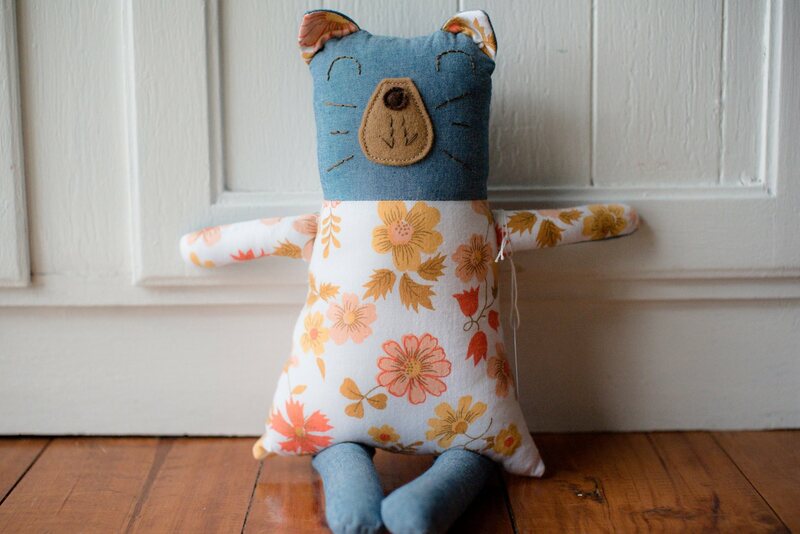 I am inordinately proud of this project. 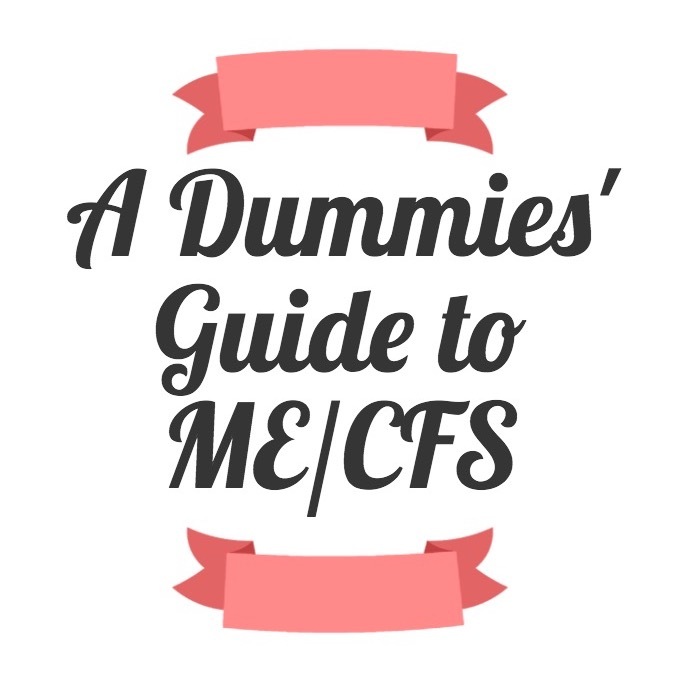 It’s one of those things you look at and think, I made that? It was also a pleasure to make. Now that I’ve got the hang of colourwork, it is pure joy to knit, and I’ve already bought kits for two more colourwork projects (Strokkur currently on the needles, From Galway to Shetland for the Ljós hat). 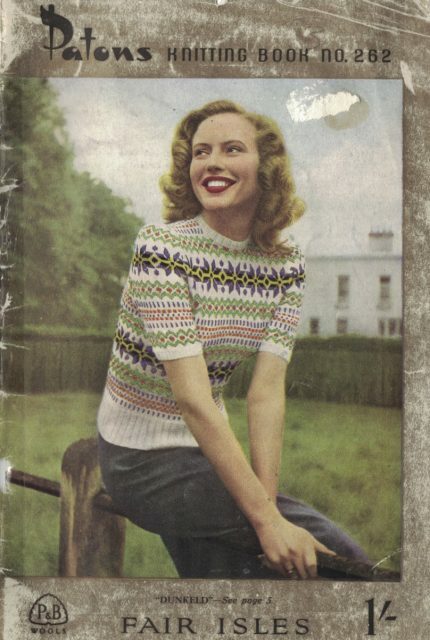 I can only recommend this pattern for anyone who wants a truly enjoyable, beginner-friendly Fair Isle project. The seam makes it a little bulky at the lower portion in the photo but I love the crown shaping so much I had to share it with you. 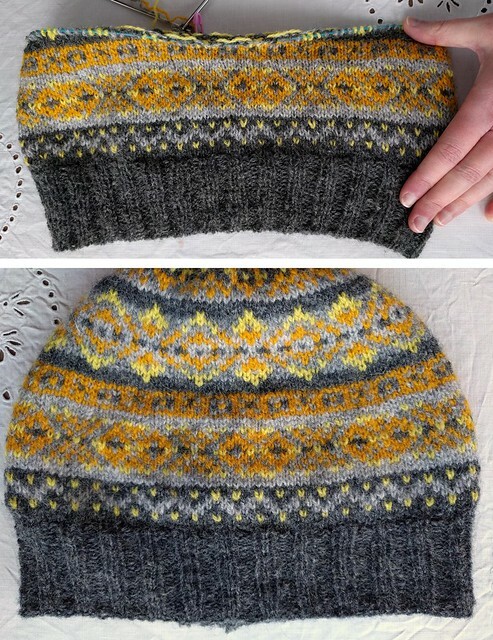 Pattern details: “A slightly slouchy Fair Isle patterned beanie in one of my favourite colour combinations — grellow. 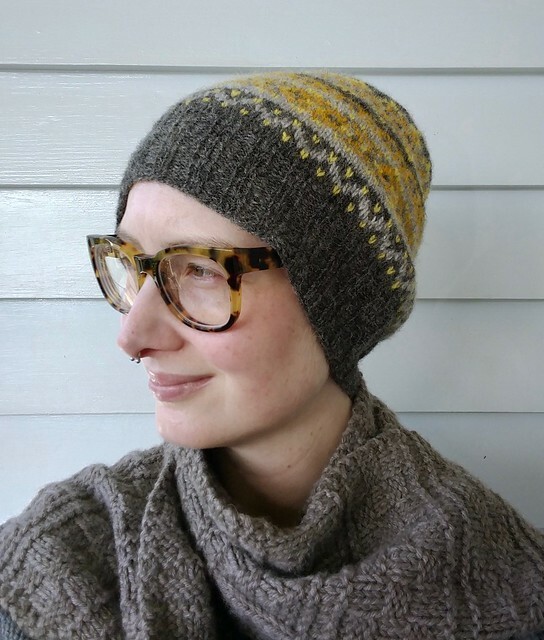 Deep ribbing keeps things simple and streamlined from the front, with the colourful Fair Isle a beautiful surprise when you turn your head.” Available as a part of Knitworthy 2 or an individual pattern download. Yarn: Jamieson & Smith 2 Ply Jumper Weight in 23 yellow, 203 grey, 27 mid grey, 54 Oxford grey, 91 orange (bough as a kit from Ysolda’s store). Mods: Knit size L with a smaller ribbing, then seamed to a size M (with ribbing approx. 104 sts or 20″ wide). Thanks! You’re right, it does look like a sunburst. On the rare occasions I knit, it has to be nice and complicated to keep my interest, so colourwork or Aran suits me well. I like that little hat and I’m glad you salvaged it, it matches your glasses really nicely! Aren’t you the clever one, only knitting aran or colourwork! I HATE plain knitting. HATE rib. Hate knitting pretty much, so it has to keep my interest. I used to make a lot of picture jumpers for the kids when they were small. The last thing I knitted was about 2 years ago, when I made a cable knit coat…I nearly destroyed my hands, and never wear it. Cost a fortune too. No more knitting! That sounds like a LOT of cables. I love them but after my last failed project (cables jumper) I think I need a big break. I think I have pics of my version somewhere, but will have to hunt! Haha, I actually did that for quite a while before it occurred to me to seam it! It’s really lovely and looks perfect with your glasses. And I love the ‘bigness’ of it, even after seaming. It just looks so toasty and inviting. It is so warm and toasty yet lightweight. I definitely want to work with more Shetland wool considering how nice this is to wear! I love the size too, just wish it would stay in place on my forehead! Haha.